Yesterday was my big day....Yeah, my birthday! It's been a hectic day and don't even have time to celebrate my birthday this year or pamper myself with an elegant treat. Don't feel like buying a ready made cake either, but did make a quick one though. 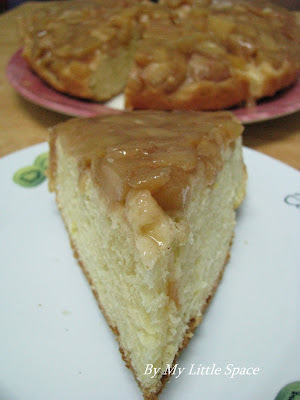 A Pineapple & Apple kuchen! Kuchen in Germany means cake. So, at least I have my cake....a simple slice of cake! So, what do you think about having a non-cream cake for your birthday? Frankly, I don't mind at all. - combine ingredients (A) and leave to rest for 10 mins or untill bubbling. - combine ingredients (B) and stir into ingredients (A) untill well mixed. - add in ingredients (C) to form a sticky dough and let to rest for an hour or untill double in size. - punch the dough to release air and press dough over to the pine-apple fillings. - bake a t 170'C-175'C for about 35-40 mins. - combine all ingredients except flour and simmer over low heat untill tender. - then off the heat and stir in flour untill well mixed. - leave cool before spreading it over to a 9" spring form tray. Surprisingly, everyone likes it! It looks like a cake but tastes like bread. My son wallop about half of the cake and still requesting for more. Truely satisfying! I think it would probably goes well with some custard cream too! Enjoy! Happy belated birthday to you Kristy! and that is a very lovely much healthier birthday cake. Looks delicious too! Belated Happy Birthday Kristy! Lovely cake. HAPPY HAPPY BIRTHDAY!!! I'm so glad you got to enjoy it with this yummy kuchen. =) Fantastic reason to celebrate! Happy Birthday to you!!! You deserve the best Kristy! I usually don't get a cake for my birthday. Making it yourself at least you get what you want! A good tasting simple cake!! Yummy!! I found some pandan extract! Before I had asked the lady at the checkout who usually works the store part. She said they didn't have any and she wanted to know what name it was in English. Then Sat when Maranda and I were waiting for our lunch we were in the back with the younger girls that cook, I asked one of them and she got it for me! So there you have it. I'll make a pandan treat in your honor! Take it easy and celebrate!! Happy Birthday! The cake looks delicious! A very happy birthday to you,Kristy. The kuchen looks summery, healthy and packed with fruit flavor! Happy Birthday, Kristy! I hope you stuck a candle in that delicious cake! Happy Belated Birthday Kristi! Hope you had a special day. The kuchen looks wonderful! happy birthday Kristy....I hope you had a great day! your pine - apple cake looks delicious! Am I already late for your big day? Hence...what am I waiting for...BUON COMPLEANNO KRISTY. Wishing you all the great things that you deserve. Happy birthday Kristy, may you have many many more years to come. Love the look of that soft crumbs on your b'day cake. Happy Birthday to you, yes, I also like non cream cake. Happy belated b'day, Kristy! Non cream, non icing that's what I prefer anytime. Kristy, Happy Birthday! I wish you lots of love, health and happiness. Love the topping of this cake. p.s. "Kuchen" means "cake" in German. I usually get some pocket money for my birthday from my parents-in-law, and use them to get some anti-wrinkles stuff for my birthday. Happy birthday to you! Happy birthday to you! Happy birthday to Kristy. Happy birthday to you! I'm bookmarking this!!! Very very interesting!!! I'm "dead hard" whenever I see something baked with apples. Happy Birthday! Kuchen sounds so much coler than cake =] It looks really yummy! I love pinepples and apples =] I don't mind having a non cream cake for my birthday either. Although I don't really mind not having a cake at all....as long as there's lots of good food! Many More Sweet Returns of the day Kristy...! May success follows your way. OMG, I'm totally thrill by all the greetings! I LOVE YOU GUYS SO MUCH! Actually, I just got back from my hubby's workshop and so dead tired! BUT....not anymore! You guys really made my day. Thank you so very much for visiting me today and really appreciate it. Hope you're all having a wonderful day too. All the best to all of you too! Happy, Happy Belated Birthday to you. So glad you got a great day and your lovely kuchen. The pineapple filling sounds outstanding, yum! Happy belated birthday! Love the pineapple filling! Natasha : Thanks and glad that you like it too! Sweetlife : Thanks and welcome to my little space! Hope to hear from you more often. Thanks for stopping by everyone! Hope you're all having a wonderful day too. HAPPY BIRTHDAY KIRSTY DARLING !!! !A belated one also count ya...hahaha your cake looks great and I know it is delicious too. I hope you had a fabulous time . I have been busy too ! And yup Jo is having a wonderful time there :) Can't wait to have her back with me. Miss her lots !!! Happy birthday Kristy and looks like w/o knowing i have a little suprise for u onmy blog, no it aint an award!!! wishing u a wonderful year ahead!!! MrLonely : Welcome to my little space and hope to hear from you more often. Mary : Thank you very much and same to you! Elin : Thanks alot, dear! Actually, I really need some rest. Mia : I'll hop over ASAP! See ya later, sweetie. Thank you very much for visiting guys. Hope you're all having a fabulous day too! Happy Birthday to you! I would be perfectly okay with a non cream cake. In fact, I would prefer it. I hope that you find the time to pamper yourself. Happy Belated Birthday Kristy! 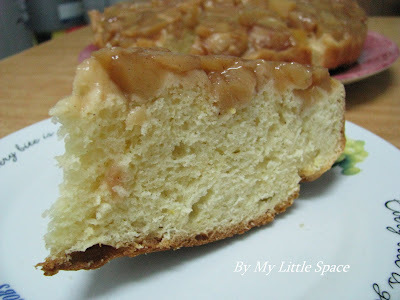 Wish all the best and post many awesome recipes ;)) The Pine-Apple Kuchen looks fabulous. So sorry I'm late to give you my birthday wishes. I'm quite busy lately due to school holiday. Hope everything will go back to normal soon. Chanced upon your blog and boy, u sure love to cook ! I've taken up cooking only recently and would definitely love to expand my repertoire. if you have the time and leave a comment. HAPPY BELATED BIRTHDAY TO YOU, KRISTY!! A Very Happy Belated Birthday Kristy! I've been busy and didn't have time to check out your blog. Anyway, better late than never, right? HAPPY BELATED BIRTHDAY TO YOU KRISTY! Thank you all for visiting and the greetings! Love you all! Hope you're all having a great weekend. oooh sorry I am late...Happy Birthday!